Asepsis of root canal systems has long been the goal of endodontic treatment. The historic use of chemotherapeutic agents to disinfect intracanal tissue has not been realized, and the efficacy of the medicament is based on the ability to reach infected pulpal tissues in complex anatomy (Figure 1) where no instrument is capable of shaping; and secondly, the toxicity the agent possesses will also have an effect on the viable periradicular tissues it contacts, should it pass through any portals of exit. Using conventional side-vented irrigation needles, the critical factors in determining elimination of biofilm, organic tissue, and canal cleanliness are depth of needle penetration and volume of irrigant.1,2 A computational fluid dynamic model found an apical “dead water zone” beyond the irrigating needle tip whereby no fluid movement occurred leaving the apical third unaffected.3 The parameters that would enable fluid interchange at this level include apical matrix size, taper and needle gauge. 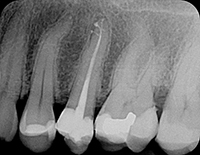 A recent investigation found apical enlargement to size/taper 40/.04 enabled optimum volume of irrigant to flow at the desired apical depth using a negative pressure irrigation system.4 The curvature of complex root canal systems may not, however, permit these preparation sizes without compromising the integrity of the tooth and iatrogenically damaging the canal. Regardless of the ability to create enlarged canal spaces to accommodate irrigating needles, intracanal medicaments cannot reach aberrant anatomy and, therefore, do not come into contact with the infected pulp or microbes. A system that would remove the impediments to cleaning throughout the root canal system down to the tubular dentin level and eliminate biofilm would result in total canal sterilization, something that has been unobtainable thus far. A recent advancement in the delivery of laser energy into the root canal system has many investigators excited. Specifically, the creation of a system of laser-activated irrigation (LAI) that produces explosive vapor bubbles with secondary cavitation effects, allowing removal of debris from intricate anatomy (Figure 2). This permits fluid interchange and the removal of organic tissue and microbes, resulting in tubular dentin disinfection. 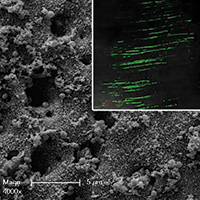 A novel nonablative, 9-mm long, 600-µm diameter quartz tapered tip with the polyamide sheath stripped 3 mm from its end (Figure 3) is used with an Erbium:Yttrium Aluminium Garnet (Er:YAG) laser to deliver shockwaves throughout the root canal system.6 Photon Induced Photoacoustic Streaming (PIPS) uses extremely low energy levels (< 20 mJ) and short microsecond pulse rates (50 µs at a wavelength of 2,940 nm) to create peak power spikes that generate a profound shockwave which travels 3-dimensionally throughout the root canal system. Years of development have resulted in a laser-activated irrigation system with energy transfer at subablative levels, inducing a photomechanical event rather than thermal. Critical to the success of the system is having a sufficient volume and constant flow of irrigant available to allow a “sonic boom” effect to ripple throughout the root canal system. Application of the PIPS laser activation protocol involves holding the probe stationary in the coronal aspect of the preparation only, unlike negative pressure or ultrasonic devices, with the access cavity chamber filled with irrigant. This application allows the irrigants used to stream 3-dimensionally to all internal aspects of the canal system, even into the distant apical portion. Since PIPS has been shown to be effective in this movement, irrespective of depth of probe penetration, the necessity to enlarge and potentially over instrument the apical third, as is often necessary with other irrigation techniques to achieve sufficient volume of irrigant, is avoided. This has significance in permitting minimally invasive preparations in canals of all curvatures. Figure 3. This image depicts the novel 9-mm long, 600-µm diameter quartz tapered Photon Induced Photoacoustic Streaming (PIPS) tip with the polyamide sheath stripped 3 mm from its end and immediately before placing into the flooded access cavity. PIPS is a unique laser application utilizing the Er 2,940 nm wavelength. The Er:YAG is used because of its high affinity, chromophore, for water, and its hydroxyl group. This coupled with the specific short digital pulse duration of 50 µs, low energy levels of 20 mJ with high peak powers of 450 W, creates a significant and profound photoacoustic shock wave that allows for 3-dimensional (3-D) movement of the irrigants without the need to place the tip close to the apical terminus. In fact, the patented tapered and stripped 600 µm diameter, 9-mm long PIPS tip design allows the clinician to place the tip in the coronal aspect of the access opening only and not in the canal at all. Unlike other laser systems, this application with these specific settings and the unique PIPS tip design yields a nonthermal subablative effect. These tips and parameters are currently only available with the LightWalker AT laser unit fabricated exclusively by Fotona (Fotona). In ongoing research, LAI with PIPS has significantly demonstrated the ability to remove smear layer, debride canals, lateral tubules, delicate apical morphology, and eliminate bacteria. Investigations from a recent histological study found half of the samples treated with the PIPS irrigation protocol to be rendered completely free from infection, and the group as a whole had a 99.5% median reduction in bacterial count.7 Only one sample out of 20 was bacteria free after performing standard contemporary irrigation with a side-vented needle placed to within one- mm of working length; an irrigation routine considered best practice among specialists and long recognized as the standard. Biofilms studied with confocal microscopy are optically sectioned slices that are reconstructed 3-dimensionally showing the complex topology of the object. A recent study used confocal laser scanning microscopy to examine the survivability of Enterococcus faecalis, a bacterial species that is tenacious and commonly found in endodontic cases with post-treatment disease and failure to heal. The investigators found 100% elimination of E faecalis in the PIPS/hypochlorite group, compared with 50% survival in the phosphate buffered saline group (Figure 4). Significantly, they also found, using the protocol of sodium hypochlorite and PIPS for 20 seconds, no bacteria on the canal wall or inside the dentinal tubules (Figure 5). Elimination of debris from all intracanal ramifications would not only allow activated irrigants to come into contact with all internal surfaces, permitting dentinal tubule disinfection, but intracanal medicaments and obturating materials would also be free to flow into areas previously blocked with organic tissue and inorganic debris from instrumentation. 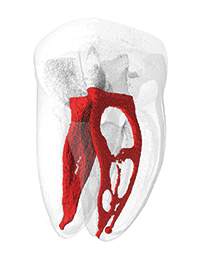 Ongoing research using high-resolution x-ray microfocus computed tomography to assess debris removal from extracted human teeth has shown a clear trend toward deep debris removal, distant from the laser probe. A recent study that compared best-practice hypothesis found that no difference in debris removal would occur between passive needle irrigation compared with PIPS irrigation. Following access cavity preparation, the mesial roots of extracted human mandibular molars were prepared in a standard crown-down fashion to within 0.5 mm of the canal terminus, enlarged to a maximum apical matrix of 0.30 mm using .06 taper ProFile Vortex (DENTSPLY Tulsa Dental Specialties) rotary Ni-Ti instruments. The samples were randomly assigned to 2 experimental groups (n = 7 each) and control groups. In group 1, 10 mL 6% sodium hypochlorite was used throughout instrumentation by placing the 30 gauge side-vented Luer-Lok needle (ProRinse [DENTSPLY Tulsa Dental Specialties]) to within 1.0 mm of the canal terminus without binding. Similarly, following canal preparation, irrigation with 4 mL 17% Ethylenediaminetetraacetic acid (EDTA) (Roth Drug Company) during a period of 60 seconds was performed, followed by a further 4 mL of 6% sodium hypochlorite for more than 30 seconds. In group 2, the same volume of sodium hypochlorite was used during preparation followed by three 30-second cycles of 6% sodium hypochlorite using continuous irrigation with PIPS activation using a 2,940 nm wavelength Er:YAG laser (LightWalker AT) at 15 Hz and 20 mJ at 0.3 W using a 12-mm long, 400-µm diameter endodontic fiber with the polyamide tip stripped back 3 mm (Figure 3 [15 Hz, 20 mJ, 0.3 W]), for a total of 90 seconds, followed by one 30-second cycle of continuous irrigation with PIPS activated water; one 30-second continuous irrigation of PIPS activated EDTA; final 30-second continuous irrigation with PIPS activated water. Analyses were conducted on percentage debris removal in one-mm increments from the canal terminus using the backscatter projections and also the 3-D volume reconstructions. Examination of a typical axial slice shows effective debris removal all the way to the canal terminus (Figure 6). What is noteworthy is the ability of the laser tip activation in the access cavity to eliminate debris at the canal terminus without altering or damaging the delicate apical anatomy and without apical extrusion of irrigant. These findings are further echoed by the histologic analysis of debris removal from decalcified sections (Figure 7). Figure 5. 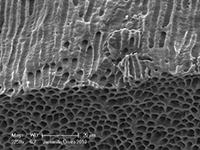 A corresponding scanning electron microscope micrograph from the confocal image from the apical third. Note complete absence of bacteria. (Courtesy of Dr. D.E. Jaramillo et al, Loma Linda, Calif.) Figure 6. 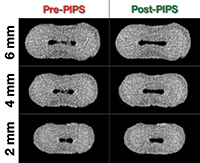 Radiographic slices at levels 6 mm, 4 mm, and 2 mm from apical terminus, showing elimination of hard tissue debris and ability of PIPS activated irrigant to penetrate throughout the canal system. following canal preparation (red) and following PIPS irrigation with 6% sodium hypochlorite and 17% EDTA (green). Note that the anatomy between canals has been completely cleaned with the nonablative photoacoustic streaming. Figure 9. 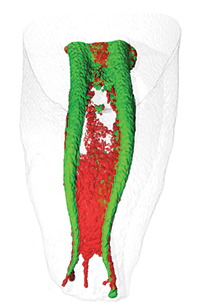 Composite of 3-D volume reconstruction of tooth prepared and irrigated with a 30-gauge side-vented needle with sodium hypochlorite and EDTA (green). Without any activation of the irrigants, debris remains between the 2 canals (red) with no interchange, blocking disinfection and cleaning. Also note apical third has 3 distinct portals of exit which remain uncleaned. Figure 10. Tooth No. 13 as completed with PIPS, showing the ability of laser activated irrigation to clean throughout the root canal system after creating a minimally invasive biomimetic convenience form. The 3-D volumes show areas previously untouched by instruments and irrigation solutions notably altered following PIPS irrigation (Figure 8), compared with the nonPIPS treated group (Figure 9). Elimination of the hard debris accumulated from instrumentation, along with the soft tissue found in these canal ramifications, allow tubular disinfection. This enables intracanal medicaments to reach areas that previously harbored microbes and the nutrients to sustain microbes, nanoparticulate sealers with low surface tension, to occupy the space and prevent recontamination. The traditional notion that the remaining bacteria will be entombed will be rendered moot. The changes in the debris removal is dramatically demonstrated in a series of online videos. Videos and presentations that accompany this article can be found online at pipsdocs.com. Download articles that explain how to use PIPS effectively and accompanying videos. A case example that clearly demonstrates the PIPS laser activated irrigation protocol can be seen in Figure 10. Creating minimal biomimetic convenience form with rotary Ni-Ti instrumentation permits photoacoustic streaming to occur throughout the root canal anatomy. Unlike conventional irrigation methods that require deep needle penetration, studies on laser activated irrigation with PIPS have confirmed the ability to move and stream fluids three dimensionally, including in the apical third. Because the PIPS tip is placed in the coronal portion only, the fluid movement becomes a reflux event and as such, positive pressure is not generated. The current protocol using a combination of 6% sodium hypochlorite and EDTA in specific combinations of 30 second cycles has cleaned tooth No. 13 to the canal terminus and demonstrates multiple portals of exit, demonstrating the incredible sealer hydraulics capable when debris is no longer an impediment. Cleaning of the delicate apical delta has occurred through laser activated irrigation and fluid interchange alone. By virtue of the effectiveness shown by PIPS in dissolving and removing tissue, bacteria and biofilms, the need for enlarging the canals to allow adequate shaping and convenience form is reduced. As such, the more natural morphology and shape of the root canal system is maintained. With this comes the opportunity to use flowable endodontic sealers such as the acrylic and nanoparticle ceramic delivery systems currently available. Laser-activated irrigation at subablative levels has the potential for complete tubular dentin disinfection in endodontics. In spite of the cost of the laser hardware, being able to reach the panacea of bacterial elimination and debris removal is a remarkable achievement and could be a paradigm shift in success rates for endodontic cases. Moreover, with the trend toward more conservative canal preparation and single instrumentation techniques, canal disinfection with an irrigating needle that cannot deliver sufficient volume to the canal terminus, PIPS seems likely to remove the gross canal enlargement impediment. Further investigation into smaller canal preparation sizes are ongoing. Any office that performs soft and hard tissue already understands the benefits of a laser. Adaptation of laser-activated irrigation to endodontics is a simple transition that is already understood by the hundreds of participants already trained in PIPS laser-activated irrigation. Similarly, a protocol for elimination of microbes from periodontal pockets using PIPS has the potential for selective removal of both inflamed and ulcerated epithelial tissues commonly seen in periodontal pathoses. The fact that the PIPS photoacoustic effect does not create thermal damage and will travel 3-dimensionally wherever there is fluid, makes it advantageous as a treatment modality for removing biofilms associated with periodontal pockets that are in difficult to access furcation areas and interproximal vertical defects. Huang TY, Gulabivala K, Ng YL. A bio-molecular film ex-vivo model to evaluate the influence of canal dimensions and irrigation variables on the efficacy of irrigation. Int Endod J. 2008;41:60-71. Senia ES, Marshall FJ, Rosen S. The solvent action of sodium hypochlorite on pulp tissue of extracted teeth. Oral Surg Oral Med Oral Pathol. 1971;31:96-103. Gao Y, Haapasalo M, Shen Y, et al. Development and validation of a three-dimensional computational fluid dynamics model of root canal irrigation. J Endod. 2009;35:1282-1287. Brunson M, Heilborn C, Johnson DJ, et al. Effect of apical preparation size and preparation taper on irrigant volume delivered by using negative pressure irrigation system. J Endod. 2010;36:721-724. Seal GJ, Ng YL, Spratt D, et al. An in vitro comparison of the bactericidal efficacy of lethal photosensitization or sodium hypochlorite irrigation on Streptococcus intermedius biofilms in root canals. Int Endod J. 2002;35:268-274. DiVito E, Peters OA, Olivi G. Effectiveness of the erbium:YAG laser and new design radial and stripped tips in removing the smear layer after root canal instrumentation. Lasers Med Sci. 2012;27:273-280. Peters OA, Bardsley S, Fong J, et al. Disinfection of root canals with photon-initiated photoacoustic streaming. J Endod. 2011;37:1008-1012. Dr. DiVito is in private practice, Arizona Center for Laser Dentistry, Scottsdale, and is a clinical associate professor teaching at the Arizona School of Dentistry and Oral Health, Mesa, Arizona. He can be reached at (480) 990-1905 or at info@pipsdocs.com. Disclosure: Dr. DiVito is the inventor of PIPS tips and is a managing member for Medical Dental Advance Technologies Group. Dr. Lloyd is an associate professor and chair of the department of endodontics at the University of Tennessee Health Science Center (UTHSC) College of Dentistry and is a practicing clinician. Dr. Lloyd was awarded the Fred Harty medal by the British Endodontic Society and has been recognized by the American Association of Endodontists, having received the 2010 Edward M. Osetek Educator award. Dr. Lloyd teaches predoctoral students and postgraduate residents in the newly formed Advanced Education Program in Endodontics at UTHSC. He can be reached at alloyd@uthsc.edu. Disclosure: Dr. Lloyd reports no disclosures.